Not so blue January! 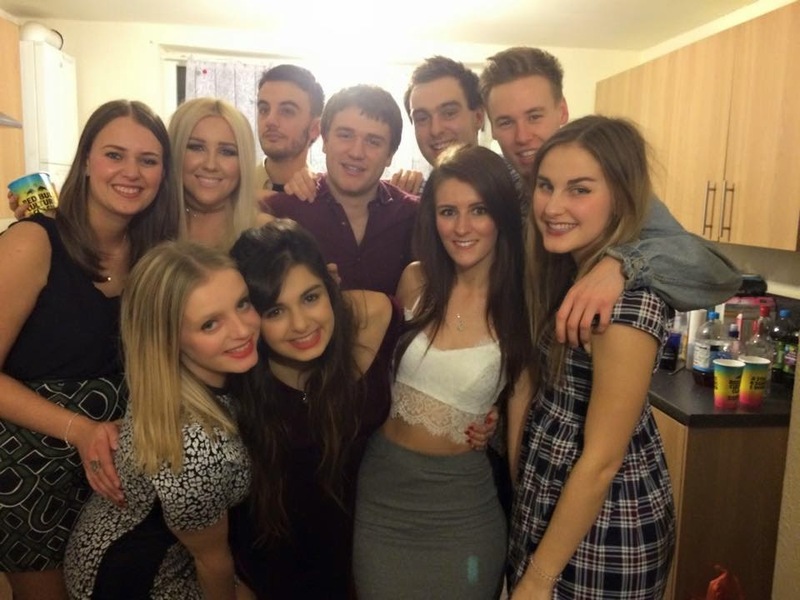 Notts, home and my first weeks back. Yes, it’s a cliché however it is totally true. I have gone from being just a regular Anna to Princess Anna and celebrity Anna. January has been fabulous. After a lovely 2 weeks at home in Bucks, seeing friends and all my family, I packed my life up again and headed for Nottingham. Despite a few major detours (cheers chauffer Melissa) I arrived at the house of Zoe, Fiona, Lilly and Lauren and was treated like royalty! I even ended up with my own drawer in the fridge and my own front door key – made me feel very at home! I loved staying with them and I can’t wait for them to come and visit me for the weekend later today!! Eeeekkk!! I partied with my first year pals, partied with my pole dance gals, snuck into pole dance classes, went out to eat and played musical beds the whole time! It was so nice to see everyone again because it had been 7 months since I’ve seen most people! My favourite part was obviously Ocean Wednesday. For anyone who’s not a Nottingham Trent student, Ocean Wednesdays is when every sports society dresses up in different fancy dress, goes on a bar crawl and ends up at a club called Ocean. It’s always the same people that go out so I saw sooooo many old faces and I can say that I’ve honestly never danced so much on a night out in my entire life. So much so that my legs were aching the next day – and I’m a dancer! I loved seeing all my Notts friends again and some of people’s reactions when they saw me (not knowing I was coming) were brilliant! Definitely felt like a princess! It was also fun to meet lots of pole freshers, it meant the start of my campaign to be Pole Dance President next year and I can’t wait to bully them all on tour in April! I also feel like I need to mention my Philly because he will cry if I don’t. Hi Philly. 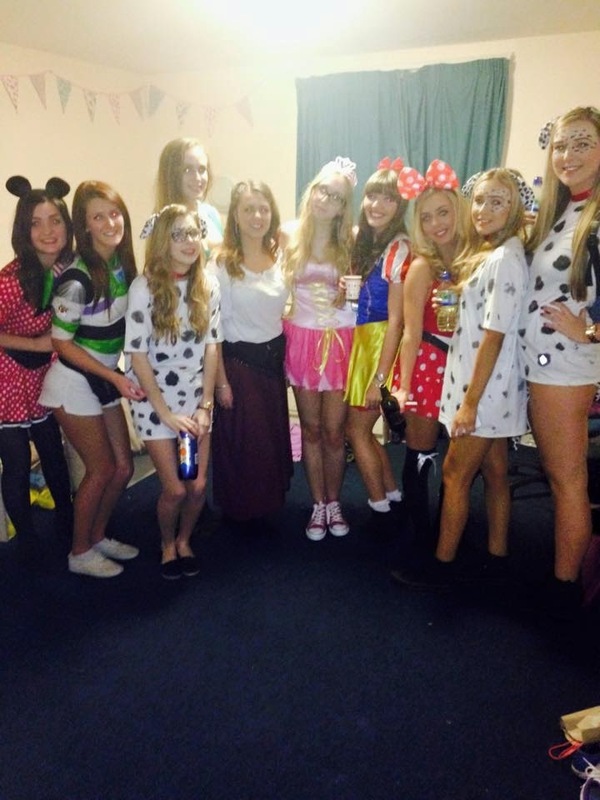 Some of the pole girls in Disney theme. I’m Buzz Lightyear! Sadly, the week ended in trauma and I spent Sunday morning crying down the phone to mum because I was so ill that I didn’t think they’d let me on my flight that afternoon. I was so hysterical and poorly that my amazing mum drove up to Nottingham to come and collect me and then she and my brother cared for me all week. Luckily, I had already planned to come home the next weekend for Lauren’s 21st as I got super cheap flights! As I was mostly better by Saturday I could still go to her party! The theme was ‘something beginning with L’ so I was Little Miss Muffet. Obviously I’m not able to go home for everyone’s 21st birthday this year but us four have grown up together so their families feel like my extended family! It’s also the last time I’ll see Lauren before she sets off for her amazing travelling! Have fun and send me a postcard! 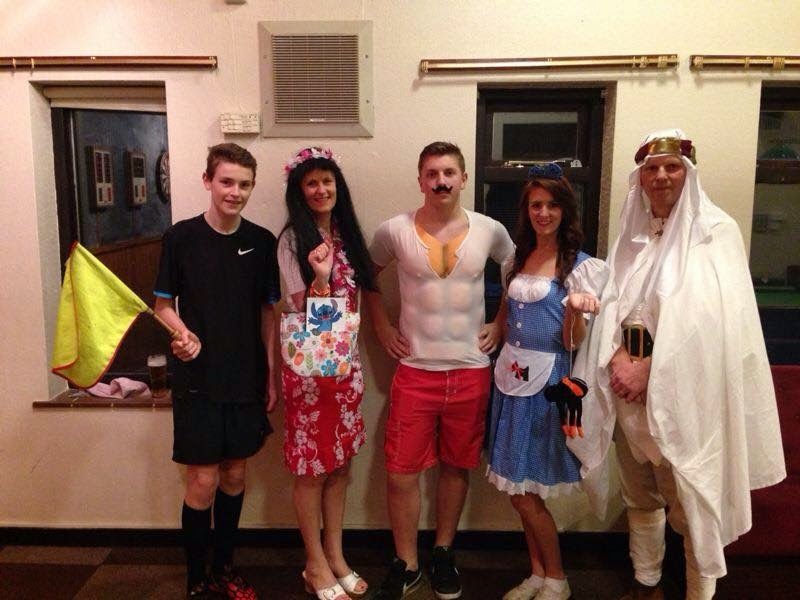 Linesman, Lilo (and stitch), Lifter, Little Miss Muffet, Laurence of Arabia. 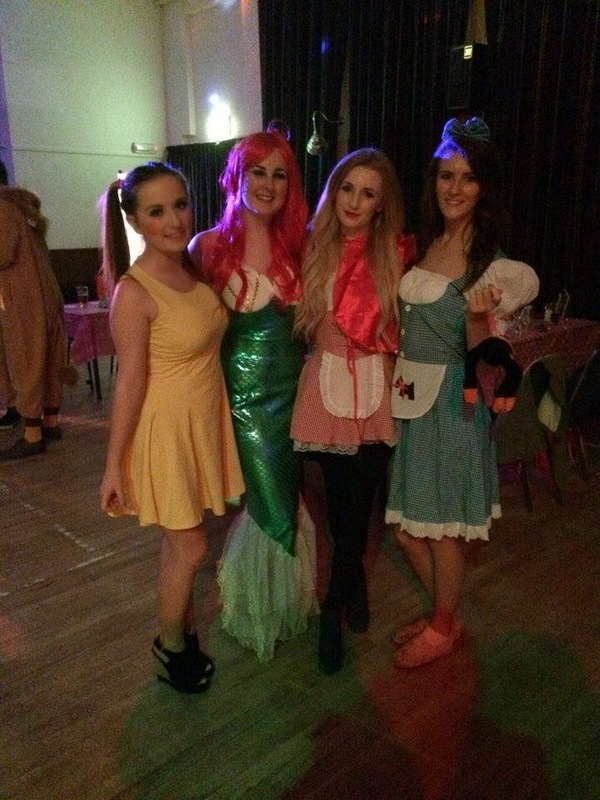 Little Miss Sunshine, Little Mermaid, Little Red Riding Hood, Little Miss Muffet. aka Martha, Lauren, Chloe and me. The next week I started back at school. This is when I became ‘Celebrity Anna’. I was greeted by a flurry of teachers commenting on how long it had been since they last saw me and there was lots of cheeky kissing everywhere I went! As there are 24 classes in my school and I only work 12 hours a week, my timetable has changed so I am now with year 4 and year 1 for the first time. Clearly some kind of rumour had spread about this mysterious English girl they call Anna and that she was one day going to appear in classes. As I walked into my first class with 4b I had about 6 children around me saying “are you Anna?” “eres Anna?” and then they all shrieked when I told them I am indeed the mysterious English girl they call Anna. At the end of this class I signed my first ever autograph. I then signed about twenty more before I thought it a little weird. At break time in the playground the madness continued as I had a collection of children from 4d surrounding me with “are you Anna?” “eres Anna?” and then ran screeching to their friends that the mysterious English girl they call Anna is here on the playground. The hype didn’t stop with just year 4, I was greeted with “AAANNNNAAAAAAAAA” in every classroom I entered that week and the week and the week after. 6a even gave me an applause. Although my job is officially as a language assistant and the rules say that I am not actually allowed to teach a class, I now teach 4c all by myself (although their tutor who does speak good English has to be there too). I found this out about 60 seconds before the class started. Luckily my improvisation skills were on point and we actually had a really good lesson! I’ve also had to start a few classes alone if the other English teacher has had things she has to do in an emergency but Simon Says will never ever fail. As usual, I’ve been going out and partying. I still can’t get my head around the fact that the Spanish just drink in the streets and police do not care and this week, a photographer even got a snap of us as if we were in a club! I’m very happy to be reunited with my cubalitros (a litre of spirit & mixer), being in Notts with little jager bombs and shots just felt weird. I’ve also broken my own record of the latest I’ve got in from a night out – 8.30am. Yes, I did have a little nap on the tram home. 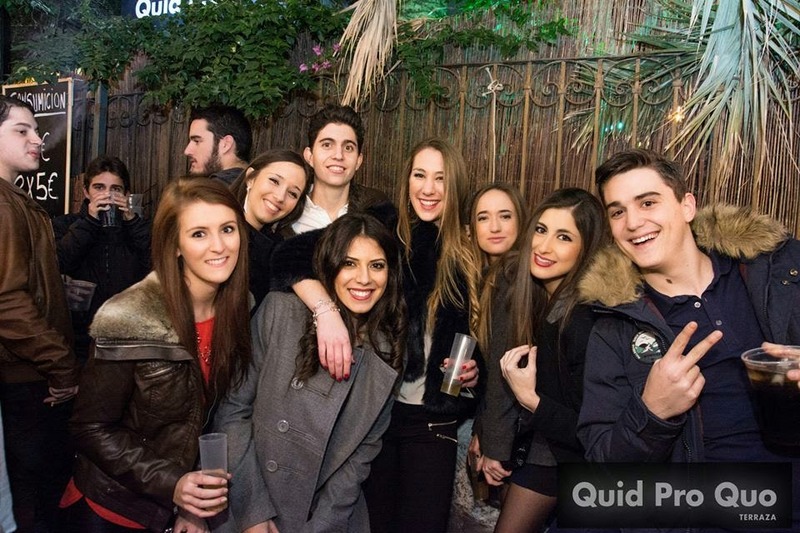 Me, Sofia, Pablito, Nuria, Ana, Irene and Victor. This was taken in the street! Oh, and as my new status as celebrity I thought I needed a new pad. I am now a permanent resident in a flat in the city centre! It now takes me only half an hour to get to work, 5 minutes to walk to the bar area and 20 minutes to dance classes! I pay a little bit extra but I have a bigger bed, bigger room and the best part is, I won’t be alone on weekends anymore!! I’m with two lovely girls who are both masters students; one is Spanish (so goes home occasionally) and the other is Venezuelan (weirdly, doesn’t go home often). I miss having Lua the cat for my siesta buddy but I am a very, very happy girl here! I have a lot to look forward to this term including my uni friends coming tonight, Carnaval, Las Fallas, work friends coming, pole competition and more! The life and times of an English teacher in Spain. Term 1. Tour Guide Anna – Uni girls visit!